This delicious chicken fajita salad is the perfect healthy dinner idea! These marinated chicken thighs and salad dressing can be used with any other recipes too! What Goes in a Low Carb Fajita Salad? 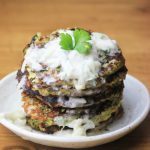 Practically anything could go in one, but you do have to watch out for the high starch vegetables and legumes! 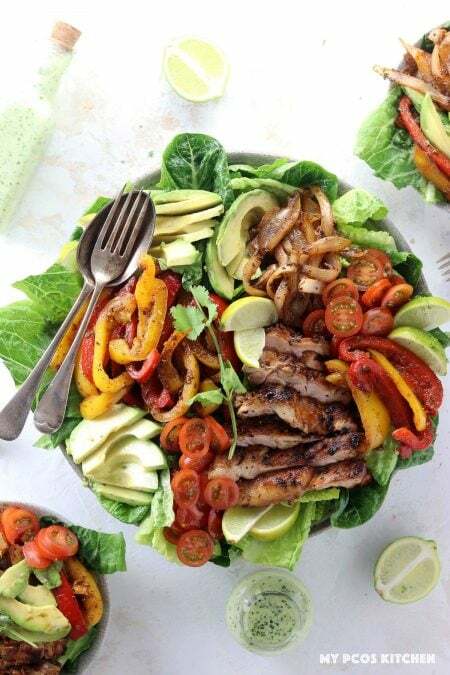 A fajita salad would normally include ingredients like beans, corn or tortilla chips, but if you’re on a low carb diet, those are all no gos. 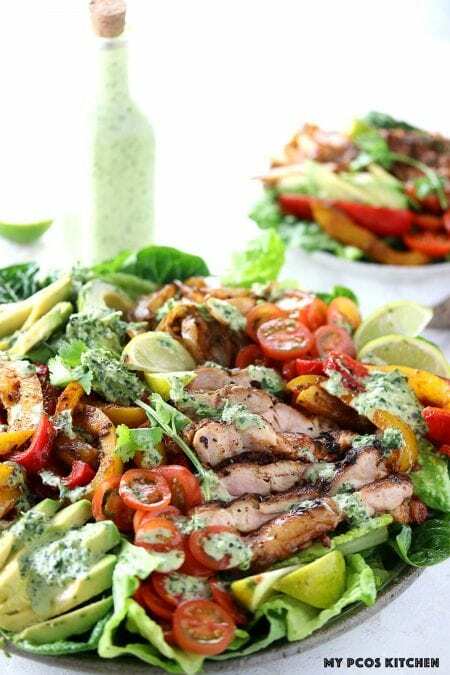 Instead, opt for a salad full of delicious grilled meat and fresh vegetables. For this low carb chicken fajita salad, I decided to use bell peppers, onions, avocado, cherry tomatoes and grilled chicken. You can also use any type of lettuce you want, but I had some romaine on hand so that’s what I used! You could add cucumbers, olives, red onions, crushed pork rinds for crunch, cheese, sour cream and even salsa! Customize it the way you want! 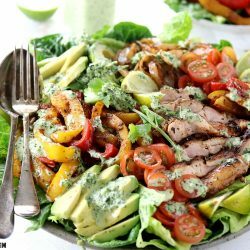 A fajita salad is extremely similar to a taco salad in terms of ingredients, which usually consists of ground meat, but a fajita one will usually use chicken or flank steak. When making fajitas, I love to use the juiciest cut of meat possible. 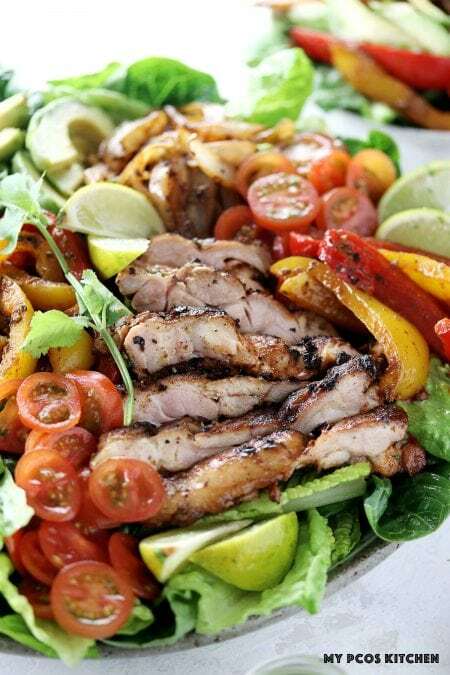 For this low carb fajita salad recipe, I went with chicken thighs because they don’t dry up, absorb flavours really well and are a pretty fatty cut of meat so end up really juicy. My favourite way to make chicken fajita is to let the meat marinate in a bag with all of its spices. I used a combination of cilantro, garlic, lime, oil, paprika and chili flakes. I massage all of the spices into the meat inside a plastic bag and let it sit for at least 30 minutes, but the best would be an entire day in the fridge. It’s best to use the freshest spices and ingredients you can find, as dried stuff usually has less flavour. Make sure to use real garlic as the tubed one barely tastes like garlic! You can cook these chicken thighs any way you want. I decided to grill them in a frying pan, but you could also bake them in the oven or BBQ them. I would absolutely LOVE to BBQ these, but alas I don’t own one!! I have a little balcony in my apartment, but we’re not allowed to BBQ things on them in Japan because the noice “may” bother the neighbours. If you’re using bell peppers and onions in your salad, you’ll want to cook those up with some taco seasoning. Make sure to use homemade taco seasoning because the store-bought ones tend to use lots of sugar, starches and additives. You can cook your vegetables together in the same frying pan, but I cooked them separately for the sake of the picture. When making a chicken fajita salad, you can use a variety of salad dressings. Today this recipe uses a homemade cilantro lime vinaigrette that I made a in a previous blog post. 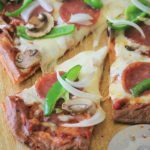 You could also use a spicy buffalo ranch or even an avocado ranch dressing! Try different types of vinaigrettes to see which one you prefer! For the cilantro dressing, you can use any type of oil you want. 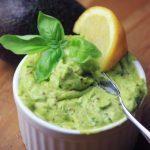 For this recipe, I chose to use a light olive oil, but you can also use avocado oil if you like its flavour. 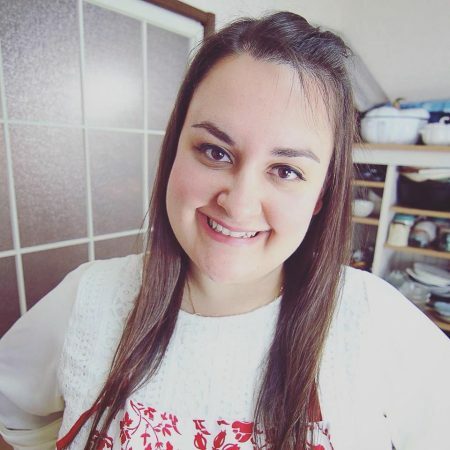 Here are a few more Mexican recipes that you might enjoy! These all use my homemade Paleo taco seasoning mix! 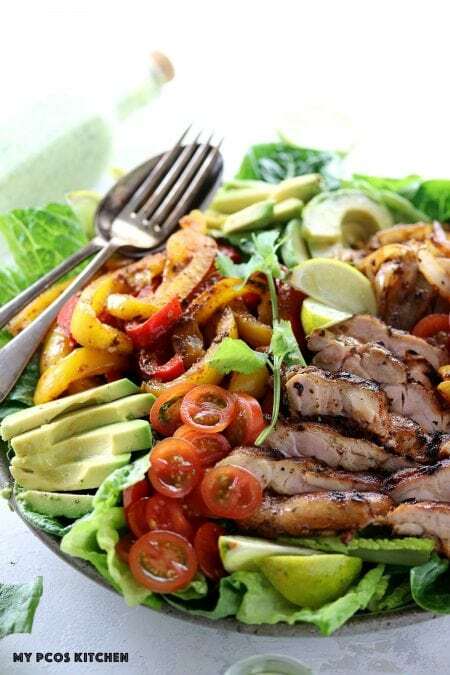 A delicious Mexican salad made with grilled chicken thighs and taco veggies. Mince the garlic and cilantro. 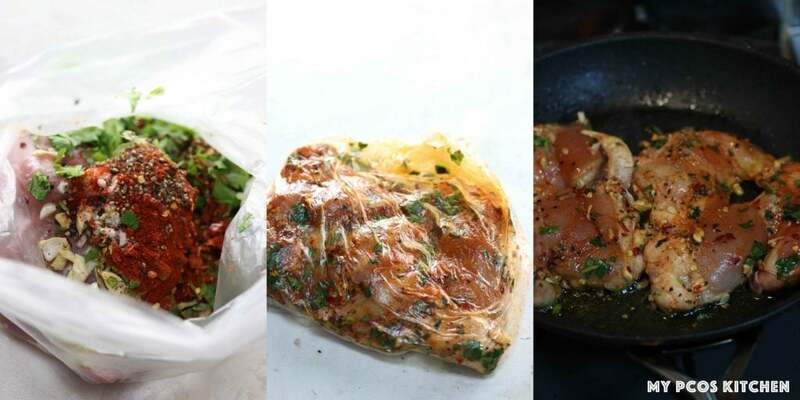 Add all of the ingredients with the chicken inside a plastic ziploc bag and massage the spices into the chicken. Make sure it's coated properly and leave in the fridge to marinate for 30 minutes - 1 day. Heat the one tablespoon of olive oil in a hot skillet and add the chicken thighs. Cook 4-5 minutes on each side until cooked through. Transfer to a chopping board and slice. 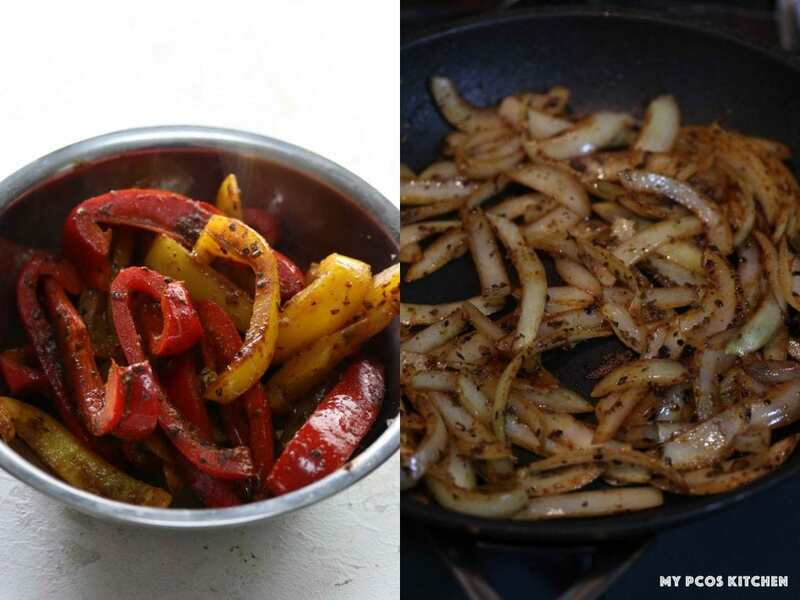 In a large skillet, add the 2 tbsp of olive oil and add the sliced onions and peppers. Cook for 2-3 minutes until they start to soften. Add the taco spice with the water and cook until the water has completely evaporated. Turn off heat and set aside. Slice the tomatoes and avocado. Chop the romaine lettuce. In a large plate or bowl, add the lettuce, tomatoes and avocado. Top with the cooked peppers and onions. Add the sliced chicken thighs. Pour the cilantro lime dressing all over the salad and enjoy! Wow, what a delicious idea for lunch!